1 Does inversion therapy really work? 2 What Is Inversion Therapy Good For? 2.4 5. Realigns the spine after workouts. What is inversion therapy good for? Well, Inversion therapy is a method where you are hanging inverted to relieve back pain and stretch the spine. This therapy works by shifting the body’s gravity, easing the pressure off the back and providing the traction for the spine. This upside down therapy is best for those people who are suffering from sciatica, poor circulation, scoliosis, and chronic lower back pain. It is a technique of being upside down while hanging by the ankle or feet in order to have the therapeutic benefits. It is a form of spinal decompression and spinal traction. For upside-down crunches and squats ankle supported gravity boots are designed for inversion therapy or inverted squats and crunched. Many research on inversion therapy shows that it really prevents spine and back problems. A research was done on 50 people with constant lower back pain with inversion therapy. They took inversion therapy for three minutes at the different position. And the research found that this therapy lessens lower back pain at 60 degrees after eight weeks. The strength and torso flexibility was also developed due to this inversion therapy. The circulatory and stretching benefit prevents future health and fitness issues. Inversion exercises really help the spine by decreasing inflammation, developing more protective fluids around spinal discs, removing waste from the spine and developing blood circulation through nearby muscles. This upside down therapy improves the gap between spinal discs and reduces pressure. Activities like running, sitting and bending create pressure on the spinal discs. This spinal discs pressure creates back pain and other complications. Studies reported that the stretching on inversion devices is a beneficial treatment for back pain. Hanging upside down regularly will help you to avoid the shrinkage that is occurred due to gravity. This gravity hampers the growth of your height. But regular inversion exercise will stretch your body and maintain your height. Inversion therapy helps to improve blood circulation by working against the gravity. It also helps to clear the lymphatic system faster and reduce the pain and aches of stiff muscles. Full-body stretches through inversion therapy relieve the stress and relax the body. Regular inversion exercise improves blood circulation and relaxes the body muscles. In this process, you will be able to get a sound sleep. 5. Realigns the spine after workouts. Different activities like running, playing tennis and aerobic exercise may cause spine misalignment. During inversion therapy, these minor misalignments are corrected and realign the spine. This misalignment is the main cause of back pain and spine problem. But through the upside down exercise this misalignment of the spine is realigned and then you will become free from the back pain. Taking inversion therapy with inversion table or other inversion devices increases better body flexibility. The little upside down movements help to make the body flexible and improve posture. If you do desk job then inversion therapy is really helpful. Inversion therapy prevents disability from back and spine problems. People those who are suffering from lumber disease may not need any surgery after using this therapy for six weeks. But it is essential to note that the spine and back problems are complex. Inversion therapy works differently for each people. So you should take advice from your doctor before practicing inversion exercise. There are different inversion therapy techniques and devices. The inversion exercise totally depends on the inversion equipment. Here are the 5 types of inversion devices that are used for inversion therapy. From the ancient period, these inversion tables are used for inversion therapy but before it was in the shape of an inversion bench. 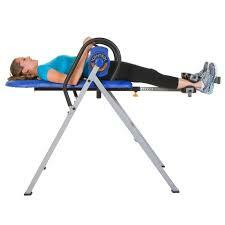 Inversion table helps to stretch the back and correct the minor misalignment. While purchasing an inversion table, you should choose it according to your requirements. Inversion tables are mainly good for abs crunches and torso rotations. Aerial yoga swing is also called as yoga hammock or trapeze. It helps to do the inversion or aerial yoga moves. This aerial yoga swing is great inversion equipment. With the help of aerial yoga swing or hammock, you can do difficult yoga moves easily. Inversion table and yoga swing are the best devices for inversion equipment. You can get yoga swing from the local market and from the online shop. You must select yoga swing according to your weight and needs. This inversion chairs are like inversion table. The Main difference between inversion chair and table is that a person will have to sit instead of stand. Different model and brand offer different facilities. Be careful while purchasing this inversion chair and choose according to your needs. These gravity inversion boots for ankles are designed to work with inversion equipment. It helps to hang upside down easily. But for this yoga moves, you will need the guidance of a good certified yoga instructor. Those who are suffering from high blood pressure, eye diseases (like glaucoma), and heart disease or are pregnant, should consult with doctors about the inversion therapy first. The doctor will help you to determine if this inversion therapy is good for you or not. Another thing is when someone tries the inversion therapy for the first time with gravity must take the help of someone standing by. Beginners should try this therapy carefully and take assistance of others. At last, we can say that inversion therapy is a great technique for back pain relief and other benefits. Regular inversion exercise will make you flexible and strong day by day.